A Legendary Event introduces our new sister company into the Atlanta market. 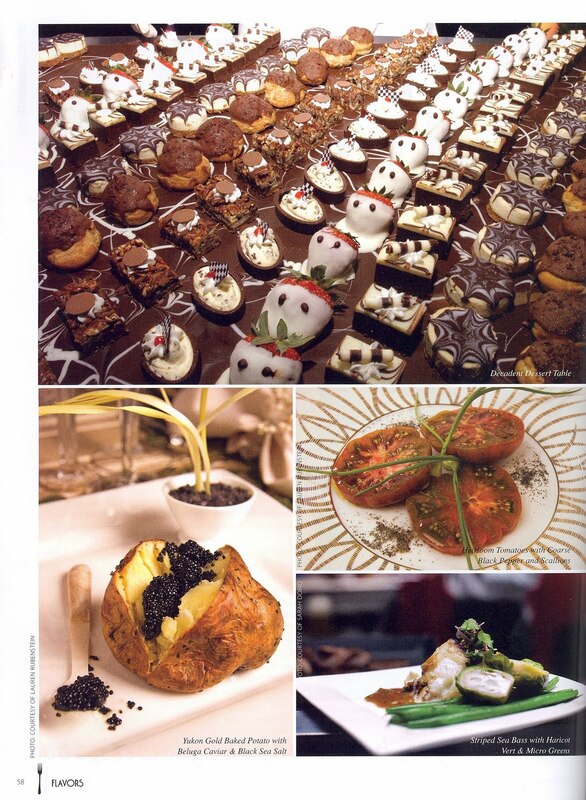 Atlanta’s Picnic Company can provide you with everything needed to produce a remarkable, unforgettable event. Whether it is a company lunch that you want to provide a picnic-to-go or a large family reunion, we’ve got you covered. Atlanta’s Picnic Company has a large selection of pre-set picnic menus to choose from or we can customize a menu to meet your every need. Not only do we provide the picnic food, but we can also supply the décor and floral items such as picnic tables, table linens, chairs, candles and centerpieces. A chef or grill attendant is required and included with all grilling menus. APC can provide you with a large list of Picnic Places. 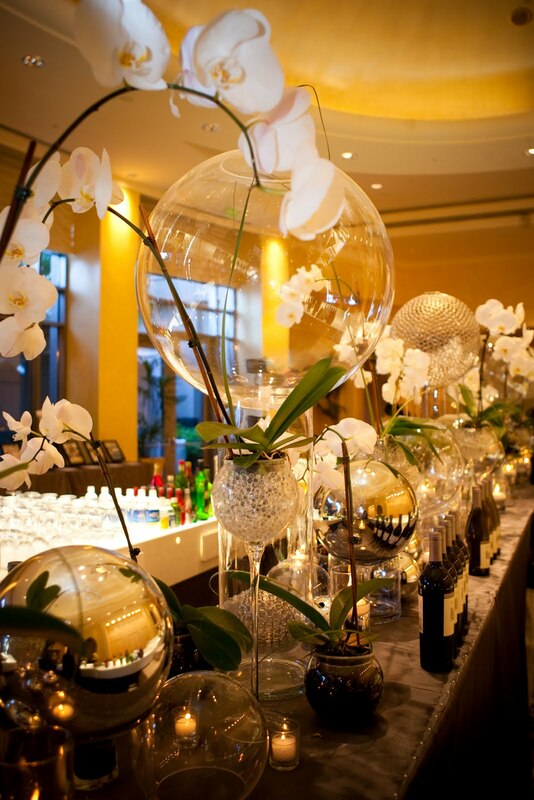 From parks to gardens, there is an endless amount of places in the city to host your perfect event. We can assist you in applying for the proper permits required for park pavilion rental, large gatherings in public parks, or facilities rentals. What is a picnic without entertainment? We have the ultimate games for your event, whether you are entertaining kids and want face painters or you are compelling adults and want a caricature artist. We have an outstanding assortment of activities available for your events including dunking machines, tattoo artists, 9-hole putt-putt setup, climbing wall and much more. 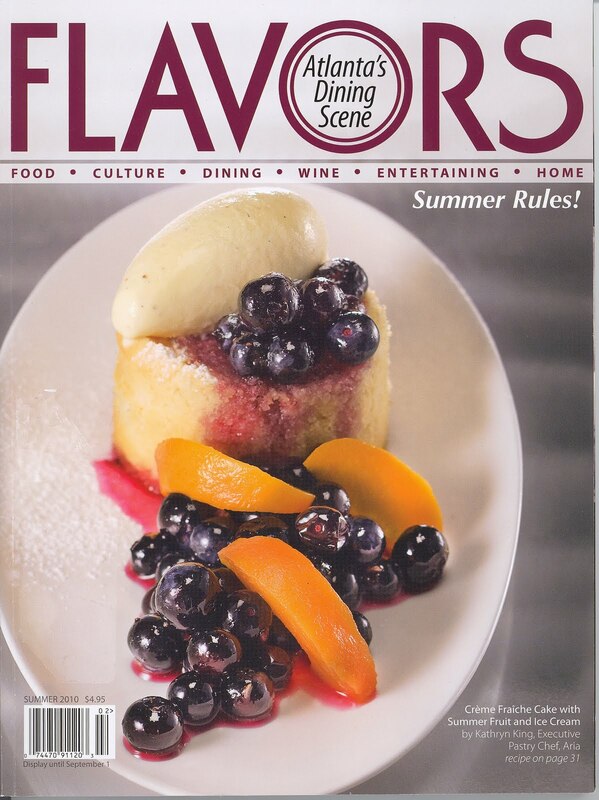 To plan the perfect picnic, please call 404.350.1498 and talk to Kelly Vincent. Picnic season is here and Atlanta’s Picnic Company has everything you need!! Visit us on the web at http://www.atlpicniccompany.com/. 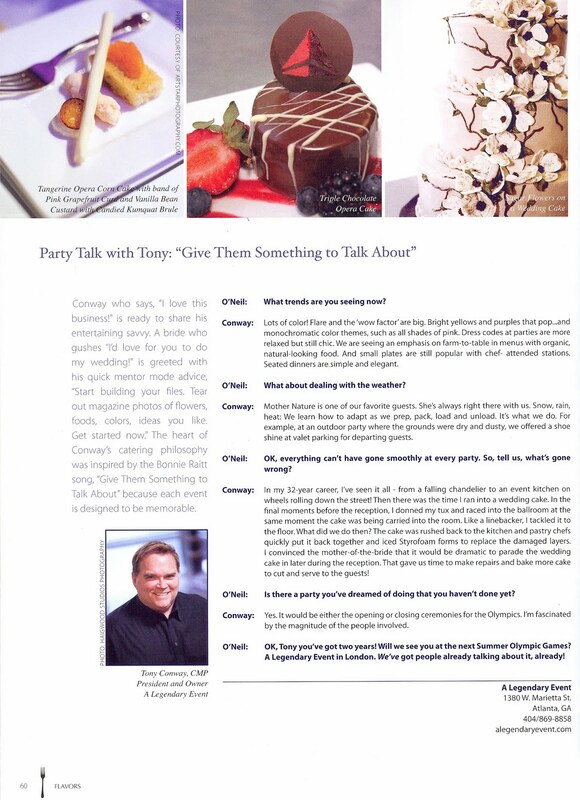 We were thrilled that the Legendary Tony Conway was featured in the recent Spring issue of Flavors Magazine. If you have ever wondered the story behind A Legendary Event, this article is perfect for you to dive into!! Have a wonderful weekend!! 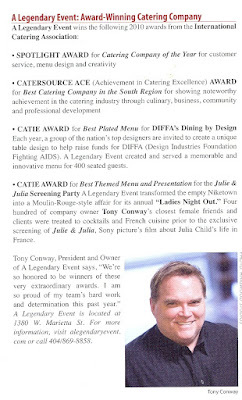 On Saturday, May 8th at the Intercontinental Buckhead Hotel, The Juvenile Diabetes Research Foundation (JDRF) held their annual gala. 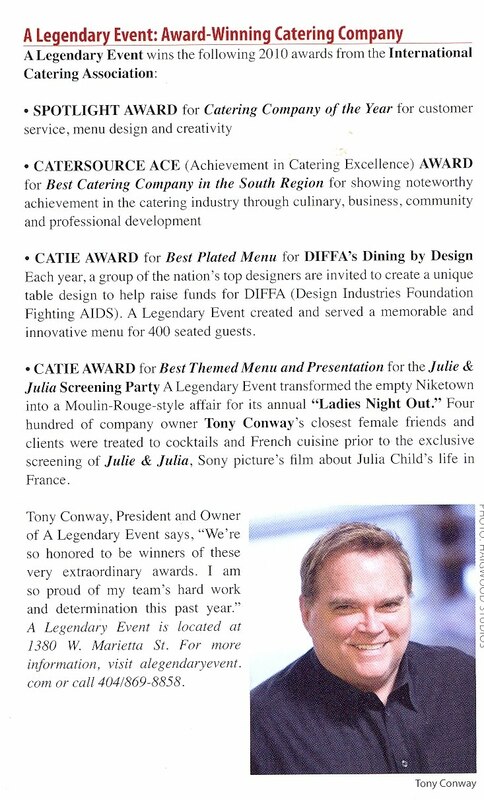 The gala is infamous for raising record breaking amounts of money for JDRF and this year was no exception as they raised over $1 million dollars! 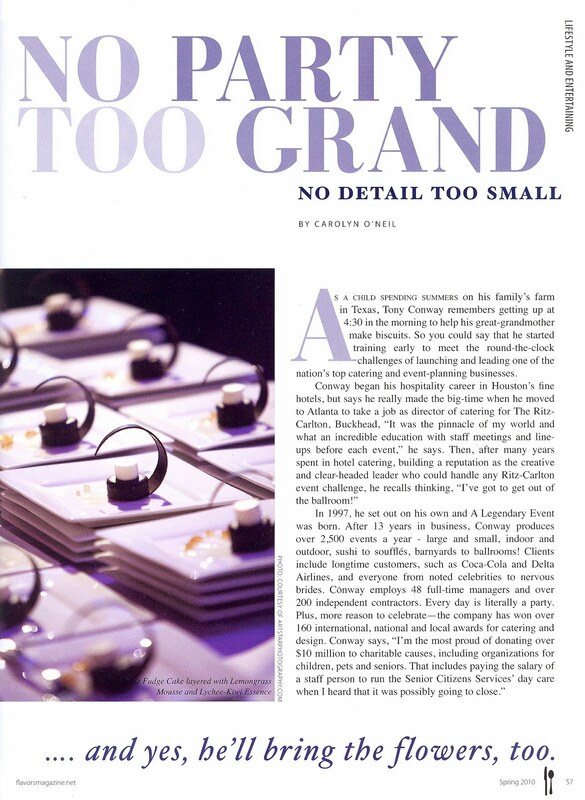 Our Creative Director, Steve Welsh, took center stage as the event designer. 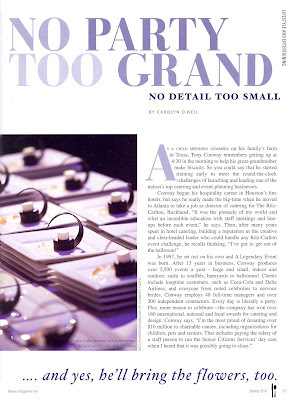 This year, he wanted to go for more of a contemporary feeling but maintain a tradition, timeless design. 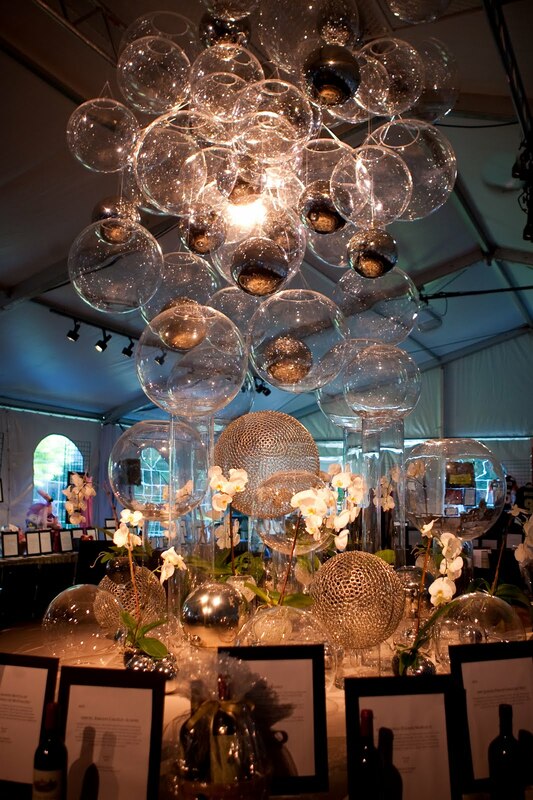 A plethora of silver, acrylic, wire and glass spheres were at the center of the design. 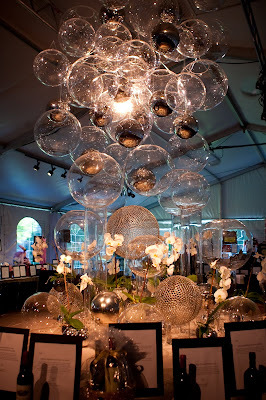 The large tent that was placed in the courtyard at the Intercontinental was centered with a dramatic element of dripping spheres hanging over a sixteen foot table. 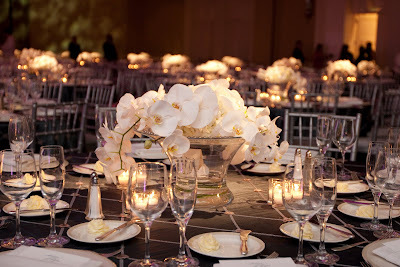 Orchids were then carefully placed around the dramatic centerpiece. 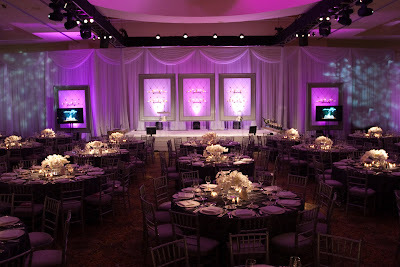 The guest tables were draped in gorgeous “Fairmont Taffeta” from Party Tables. The centerpiece was a classic cluster of white Hydrangea with white Phalaenopsis Orchids placed sporadically in the arrangement. The bar consisted of 16 of our lit bar tops with a long, skinny table in the center of the bar that held another magnificent arrangement of Phalaenopsis Orchids and silver, acrylic, wire and glass spheres. Of course, we added the proper ambient lighting with floating and votive candles. The event was a fun and exciting evening. 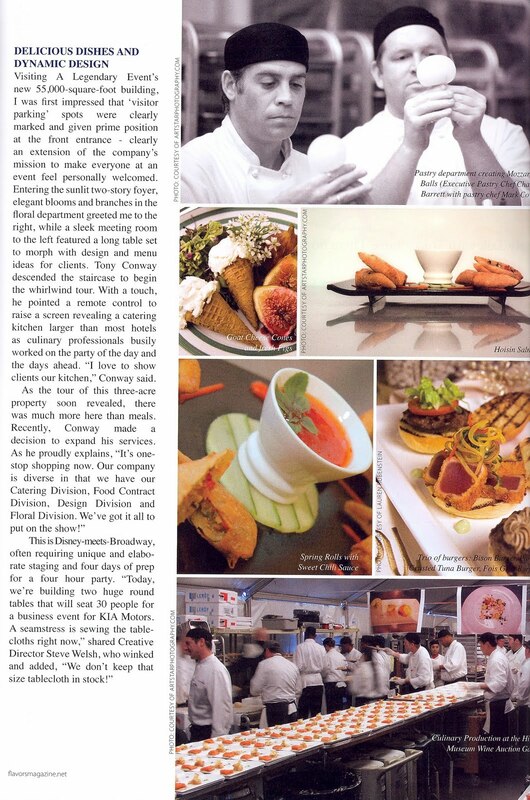 We were honored to have been chosen to do the event décor and serve as a sponsor for JDRF. This years gala brings JDRF one step closer to finding a cure for Juvenile Diabetes. Many thanks to the supporters and other sponsors!! This entry was posted in JDRF, nancy jo mcdaniel, Party Tables, Steve Welsh. Bookmark the permalink.